I had bronchitis a couple of weeks ago so I spent some quality time in bed watching movies, all the tv shows and movies I'd DVR'd, and surfing the web on my iPad. This site, StyleWe, kept popping up as a banner ad everywhere I went which was unusual since I'd never visited their website. However, one of the ads had this coat which caught my eye. So since I had nothing else to do, I surfed on over and checked out the coat. That's when my imagination went into overdrive. I love those inset pockets! And it reminded me of the Rachel Dress that I've made a couple of times, nevermind the Rachel Skirt which started it all. Then I realized my Rachel Dress pattern was perfectly adaptable as a jacket/topper. Mentally I started to rumble through my fabric collection and came up with a wool flannel print that I'd bought from Emmaonesock last year. When I finally felt well enough to go down to the Sewing Cave, I discovered a brocade fabric that came from Fabric Mart that I liked a lot better. See I envision my version of this coat as a topper to wear over jeans or leggings with soft ponte sleeves. You know elevating that everyday work look to the Chicos Chic wardrobe I'm attempting to create. I didn't just want to post the jacket front without a reference to the coat because who would understand that?! However what I did post started a conversation about what pattern was used? Where could someone purchase the pattern? And I realized that maybe I needed to talk about what inspires me to sew/create something. What drew me to the garment first and foremost was ~ the pockets. Then the simplicity of the design. I never meant to duplicate the coat. I wanted the elements of the coat to be used in a topper. That's why my Rachel Dress was the jump off point for me. It had the elements that I wanted with the clean design. I could see the alterations I needed to do, to make the pattern work for me. Finally my version detoured from the original because I used ponte fabric for sweater like sleeves. This is a look that's been circling around my brain for a minute. It works for me because this garment fits my lifestyle now...but most importantly because I NEVER intended to duplicate the original garment. When it's finished and I have photos of me wearing it, I will post pattern alterations and construction techniques because I did have to figure out a few things. Things that a picture couldn't tell me...things that I had to decide for myself to get the garment I imagined. So this is what was on my cutting table and in my sewing machine this weekend. BTW, after moving the 8900 around and then cleaning it out, in all the hidden places besides my regular places, my machine is sewing again. I think it just wanted a rest! *LOL* However, before I head out to Seattle next month, I will take it in for servicing...cause it just can't hurt! Labels: Chico's Chic, Coats, The Rachel Coat, Why I did that?! Should I bring the pattern pieces with me so that you can trace them and make one of your own? I see the same types of comments on the knitting forums. Someone posts a pic and instantly the question is what pattern. Often, there was one, but sometimes someone saw something she liked and fiddled around with her materials until she got what she wanted. So many folks just refuse to try that. For them it's all about only following a pattern. Sometimes, you've just got to jump in and risk wearing out a ball of yarn knitting and re-knitting, (or like sewing, creating a wadder), and see what happens. I love that about you. You jump in and go! Very inspiring! I can come up with a vision just fine - using the right fabric is often my challenge. That and making things because I want to make them, not because they will look good on me. Loving your fabric choice! Can't wait to see you modelling this jacket! BTW how do I find you on Instagram? I'm DiaryofaSewingFanatic everywhere on social media. I love this post and your explanations of how you find your inspiration and then create YOUR version of it. Your blog has made me look at clothing (either online, in catalogs, or on a person) a whole new way! Great pattern and a fabulous topper!! I bought Vogue 9123 last week for the jacket with ideas of making it in wool for the winter and then in some other fabric for spring/fall and a/c building. You now have ideas swirling around in my head. I'd love to rummage through your stash! Your fabric choices and styles are so flattering and desirable! Sometimes being sick brings great benefits...your body slows down while your brain has a chance to speed up and take over and make great decisions. Anytime you want to come to NJ and rummage through the shelves, feel free. The only thing I ask is that you teach me one of your amazing techniques and you can have anything from the shelves your heart desires! Let me know when you're coming! A lovely outcome for sure!! I love it already--yes, inspirational ideas--that Stylewe pops up everywhere, but I've fallen in love with it. Lot's of unusual styles, great fodder (now there's a word you don't hear much) for sewists. Now I am inspired. I just saw a topper/coat in cotton jacquard in the newest Talbots catalog. I want to copy in to wear with jeans and khakis to work. But these pockets would make it so much better. Thanks! I really love this post, it's so inspiring. I'm definitely going to attempt to make something like this when I get my new machine from sewingmakesmehappy.com Since I am a beginner though, I might struggle haha! Thanks for the post. I love reading your blog and your latest creation is so inspiring. Looking forward to seeing it on you. You are so fabulous I can't stand it! I don't read your blog enough but I look at the pieces you make and if you applied to Project Runway, you would definitely win. You are so so talented. I recently purchased some Ponte Fabric and I want to make a suit, I read your comments, so I'm going to wash and dry it, tell me what type of interfacing do you use, sew in or iron on? A ltwt fusible is what I would use. Carolyn, I saw this completed project on Instagram and oh my gosh it is so adorable on you! I love the fabric in the way you selected a simple pattern to let the fabric do the work! As I opened up this page and saw your first photo of your inspiration coat I did a double take and my pulse increased! 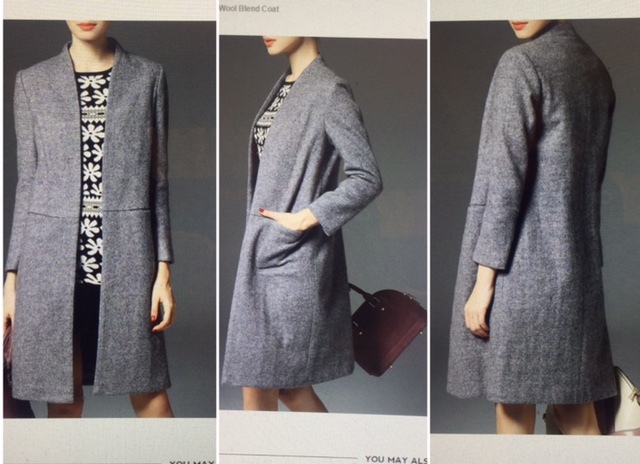 I just bought this pattern - Butterick 5473 - a Connie Crawford pattern and it looks very similar to your inspiration coat - though it sadly doesn't have the pockets inset into the waistline area, but in the side seams. (I may adjust that after reading here.) I got the pattern to make a topper for my dress for a wedding. So excited to read about your version here. Mine will be for a FL spring wedding, so I am making my topper in a beautiful stretch cotton print. I am not sure if I will line it yet, but the lining will be bemberg rayon if I do line.